- on my MSX I can only read one of three disk images. When I select disk 00, 03, 06, etc. using the two front buttons, I can read and write to the virtual disks with, according to the IPCAS software, serial numbers 000, 002, 004, etc.. This means I am able to use only 33 of the promised 100 virtual disks on one USB drive. When I select any other number on the emulator (01,02,04,etc.) I will get a "Disk i/o error" when I type "FILES". The diskimages with odd numbers, as well as the diskimages above number 066 (as viewed with the IPCAS software) can't be adressed with the fdd emulator in my MSX. - I can't copy files from the real disk drive (in fact an old PC drive that I have put in my MSX as b: drive) to the emulated disk drive. Well, I can copy one file (using copy "a:example.ext" to "b:"), but after that I receive a "Disk offline" when I try to access the drive. When I reselect the same virtual disk (by pushing the right button ten times) I can see that the file has actually been copied. - Is it usual that I hear the b-drive humming when I acces the a-drive, or may I have connected the drives wrongly to the main board? Does anybody have similar experiences with this gotek device? Or am I doing something wrong? 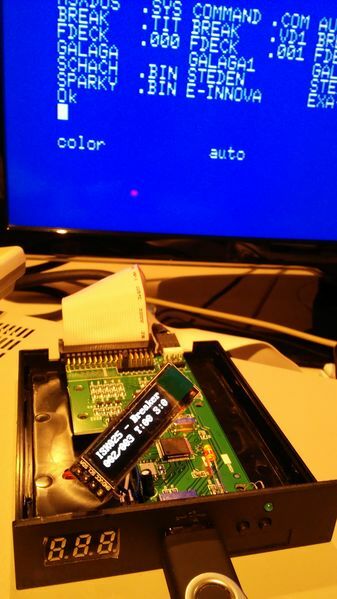 Somebody already tried with the keirf FlashFloppy firmware on a Gotek with MSX? I guess you have to rename your .dsk images to .img (raw sector formats). Although the latest version of the firmware also supports (Amstrad) .dsk, it looks to me this is a different .dsk disk format with a 256 byte header. Our MSX .dsk format does not have a header. I have one with HxC firmware in a 8250 and another just arrived for my 8245. I was also planning to try the FlashFloppy firmware. Whilst reading about it I came to the same conclusion, img is what we call dsk on msx. What they call dsk is something else indeed. It should also support HFE images. With the HxC tool one can convert dmk images to HFE. Good to know, I just ordered a Gotek. Let me know if you encountered any problems. @marcoo: Thanks, waiting for my Gotek to be delivered and I am going to give it a try! Thanks for the confirmation. @ JohanMSX, if the DSK image is a 720kb image don't rename anything. A 360kb DSK image gives some problems. I think renaming it to IMG works for a 360kb disk. It's lots of fun to experiment with. Works perfect with both 360 and 720 KB disk images (just use the normal MSX .dsk format). Flashed GOTEK with FlashFloppy firmware, loading seems to be working fine. However if I try to write something, for example save a Basic program into the selected image, I get no errors, however the file doesn't appear there. Anyone has the same problem?